An undercover Israeli force on Tuesday besieged the home of a Palestinian an Islamic Jihad activist in Qabatia in the northern West Bank. According to Palestinian security sources the Israeli force failed to apprehend Salih Abu Zaid, an activist within the Al-Quds Brigades, as he was not at home. 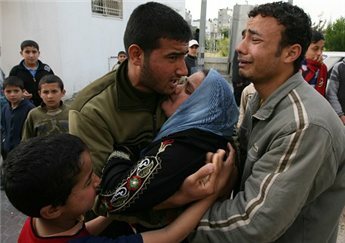 Separately, Israeli forces raided the northern West Bank city of Jenin and ransacked several homes. No arrests or casualties have been reported. In Tubas, in the northern West Bank, Israeli patrols invaded the city amidst heavy gunfire. They stationed themselves in front of the municipal council building. There have been no casualties, nor arrests reported. Palestinians in Rafah, Khan Younis and Gaza City held funeral processions for four Palestinians on Monday who were killed by Israeli attacks earlier in the day. The funeral of the Hamas fighter Husam Abu Hain was held in Gaza City. The funeral headed from Ash-Shifa hospital to the deceased's family home then to the mosque for prayer before the burial. Meanwhile, the funeral of Hamas activists Tha'ir Hani Salah and Tha'r Musbih headed from Nasser hospital in Khan Younis to their families' homes before going to mosque, and then to the cemetery. In Rafah, mourners took part in the funeral of 21-year-old Midhat Awwad, an activist with the military wing of the Popular Resistance Committees, the An-Nasser Salah Addin Brigades. The mourners in all funeral processions condemned the Israeli criminal acts against the Palestinian people, demanding that Palestinian military groups take revenge. 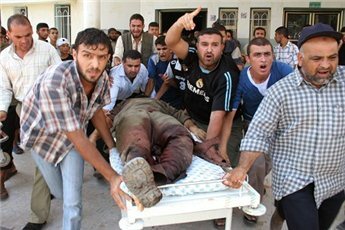 Four Palestinians were killed after the Israeli warplanes launched two attacks at groups of fighters in the Ash-Shuja'yya neighborhood in Gaza City and the village of Khuzza'a, east of Khan Younis. Al-Qassam Brigades also announced that two other activists have been injured in Khuzza'a. They named them as Hani Abu Salah and Tha'ir Musbih. Eyewitnesses told our reporter that Israeli warplanes fired three missiles at a group of activists in Khuzza'ah killing two and injuring two others. In the Ash-Shuja'iyya neighborhood, an Israeli helicopter fired at least one missile at a group of Palestinian fighters, killing Husam Abu Hein and injuring another seriously. Later on Monday, medical sources at Abu Yousif An-Najjar hospital announced that corpse of Midhat Awwad, was found. Sources told Ma'an that medics found the corpse lying on the ground after the Israeli forces which invaded Rafah this morning withdrew. He seemed to have been wounded and left bleeding until he died. Israeli forces raided the northern West Bank town of Zeita north of Tulkarem and ransacked several houses on Monday morning. Ma'an's reporter said that a fierce confrontation erupted near the separation wall in the town between Palestinian youths and Israeli forces. Teenagers pelted the invading forces with stones and empty bottles while the soldiers fired gunshots and sonic bombs. No casualties or arrests have been reported. Eyewitnesses said that the Israeli troops invaded the town's graveyard on the pretext of searching for searching for stone-throwers who hid in the graves. The Israeli forces stormed an ophthalmology clinic in Nablus in the northern West Bank, destroying the interior of the building, on Monday morning. The proprietor of the clinic told Ma'an's reporter that the Israeli soldiers ransacked his office on Palestine Street after breaking through the main gate and destroying the contents of the clinic. The military wing of Hamas, the Al-Qassam Brigades, said on Saturday evening that a group of their fighters survived an Israeli assassination attempt. The Al-Qassam Brigades said in a statement that Israeli artillery fired a shell towards the group at Ash-Shua'yya neighborhood in Gaza City, but the shell missed them, and some were slightly injured by shrapnel of the shell. More than 30 Israeli military vehicles raided the northern West Bank town of Qabatiya, south of Jenin, on Sunday morning and ransacked several Palestinian homes. Snipers were deployed on roofs of tall buildings. Local sources told Ma'an's reporter that the Israeli forces entered the town from the north at 2:00 am. No casualties or arrests have been reported. Three Palestinians were killed in an Israeli artillery bombardment on the An-Nizar area, east of the town of Beit Hanoun in the Gaza Strip on Saturday. Dr. Mu'awiyya Hassanain, the director of ambulance and emergency services in the Palestinian Health Ministry, named the victims as Muhammad Talal Az-Za'aneen, Ibrahim Zeidan Abu Jarad and Muhammad Hassanein, an employee at the Jordan Bank in beit Hanoun. All three victims were taken to Ash-Shuhada Hospital in Beit Hanoun. Residents said the three were having lunch with a friend and had just finished eating when Israeli forces fired a ground missile at the house. The three men were killed immediately the missile struck. The armed wing of the Popular Front for the Liberation of Palestine, the Abu Ali Mustafa Brigades, announced that Muhammad Talal Az-Za'aneen was one of their members. Palestinian youths threw stones at Israeli troops in the town of Anbata east of Tulkarem north of the West Bank on Saturday. According to our correspondent, quoting eyewitnesses, three Israeli military vehicles stormed the town amid gunfire and sound bombs. No injuries were reported. The Israeli army invaded the city of Tulkarm in the northern West Bank on Friday night, amid gunfire and sound bombs. According to our correspondent, quoting from Palestinian security sources, the Israeli army had informed the Palestinians of its intention to expand its security checks in the city but without specifying its goal. This warning was followed by the invasion of Israeli forces into the city. The troops opened fire on shops, forcing their owners to close and also stopped a number of passing cars in the city especially around Gamal Abd An-Nasser Square, Ma'an's correspondent said. The city of Tulkarm then witnessed clashes between young men throwing stones and the Israeli soldiers.